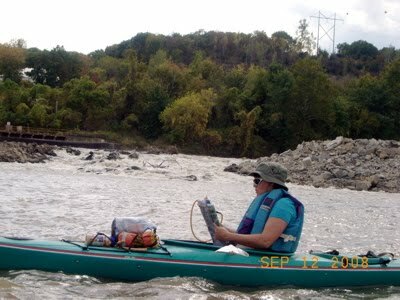 The Kansas River Inventory is a comprehensive data project being undertaken by the Kansas Riverkeeper and the Friends of the Kaw to document the state of the River and provide a publicly accessible database on physical objects in the river corridor. 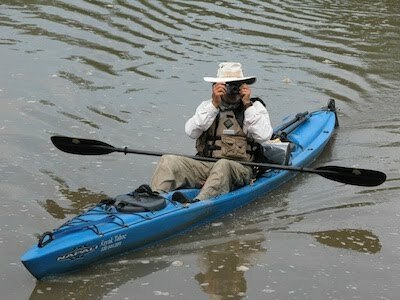 The data has been collected by kayaking the river while mapping and photographing the river corridor. Kayaks were used because they allow us to survey during low water as well as at higher flows, and we can get into areas like side channels and backwaters that are too shallow for motor boats. Paddling at an average of three miles per hour means that it takes about two weeks to survey the entire 173 miles from Junction City to Kansas City. Our data includes the locations of static objects in the channel. Pilings from bridges, pipes, power line crossings and other static objects in the channel actually help shape the channel by causing the water to swirl around them, eroding and depositing sand and gravel. There are no publicly accessible databases on the location of these objects and we are in the process of mapping and organizing this information. We have also recorded the condition of the vegetation on the banks, as well as areas of erosion and bank stabilization (including illegal stabilization projects). Much of this information was mapped onto aerial photographs of the channel and we will be providing digital imagery and GPS referenced locational data. This information will be helpful in determining areas in need of restoration, as well as identifying high quality riparian forests in need of conservation. The locations of EPA-permitted water dischargers (power plants, wastewater treatment plants, industrial facilities) has also been researched, not only by mapping during the field work, but by identifying databases available through EPA and KDHE that provide permit compliance history. These data were used to construct the maps in the Where You Live and Work section of the main Friends of the Kaw website. During field work we used a GPS camera to photograph static objects, areas in need of restoration, and to take a down river photo every river mile to document "the state of the river." These photos are currently viewable in Where You Live and Work as slide shows and embedded in Google Maps at their GPS locations to document the river corridor as it flows through each county. These photographs have been loaded into Google Picasa web albums so that we can take a virtual tour of the Kansas River. The River Inventory has given us a new appreciation for the Kaw. It is very literally a lifeline through our region, providing the water that we need for every aspect of our lives, but also providing a peaceful forested ribbon of wildlands inhabited by an amazing array of birds, deer, foxes, coyotes, frog, turtles, toads and other animals-- even in the heart of our most urbanized and industrialized regions. Friends of the Kaw has fought for almost twenty years to increase public access to the river. We hope that our River Inventory project will further this goal by providing information to everyone on the State of the River and letting the people in northeast Kansas know what is flowing through their backyards.